In honor of Valentine's Day, I'd like to share a cautionary tale of love and woe. Last week, I caught up with some former coworkers for dinner and drinks. While we were there, we ran into another former coworker who had a "friend" in tow. This "friend" had just opened up a business in the area and was looking to do some promotion. I've long wanted to do some freelance consulting, so I gave him my card. Little did I know what was to come . . .
Greetings! I hope this finds you well. It was a pleasure meeting you the other evening at [the restaurant], I was the gent sitting with [your colleague]. I write to you with a dual purpose. On the one hand, I was taken off guard with the light flashing through your eyes. I couldn't help wondering through my meal. Fleeting? Inner radiance? For verification and security reasons in these erstwhile days of code orange, I sauntered back over to your table in the shadow of [your colleague] and sure enough, the light shone through again! [Redacted], you must be a beautiful person inside considering the glow about you, gorgeous allure and beauty notwithstanding. So you'll understand it was with pent up burning poetic fury that I departed the restaurant without being able to speak with you a little. Too many onlookers in too close proximity. For that, I profusely apologize. In order to capture the spirit of unconditional positive regard, may we meet for lunch or dinner? There is Cuba Libre or Thai something or other in Georgetown or whatever suits you. If that's possible, I'll be in Washington this coming Sunday, Monday and Tuesday....have appointments Tuesday AM through around noon, at Congress of all places, for an unrelated matter. And I'm not even sure how people get acquainted these days. On the other hand, I made inquiry with [your colleague] regarding having [my business] project publicized to all [of your organization's members], those across the nation who may travel to Washington DC. I admit he did not suggest you specifically, but he did suggest I contact someone here in DC [in your office] that may be able to direct me to the right person. Well, in closing, I hope we can talk. Thanks again for your time. I'm confused. What would I be contacting you for, again? Read your message. Har har, I gotcha. But you still make a pleasant impression and I hope you're able to smile about this overall!..... Unless, like your friend implied, you prefer that my call represents an augury of harrassment, stalking etc... Writers have been accused of talking too much. Good bye. My friend and I had a good laugh over this, while still both confused. Sure, she does have a radiance about her, but our table was hardly lit by the fire in her eyes that evening. Maybe he was he had one too many caipirinhas or something and imagined that the candle on our table was in fact her eyes. Either way, he started seeing stars where there were none. I don't know. I've taken it as a sign that my freelance career can wait. So, whether you're celebrating this Valentine's Day with a loved one or spurning it in a chocolate-induced haze, I hope you enjoy! 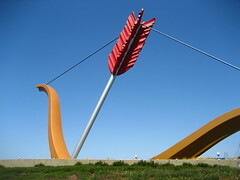 And if you happen to see this particular cupid's arrow coming your way -- DUCK! *And in honor of Valentine's Day, please share any of your disasters from the front lines of looooove . . . I would love to hear them! Sometimes it's hard to believe how fast time passes. I don't really feel any older. High school feels like yesterday . . . when in reality, I graduated almost 18 years ago. I was reminded of the passage of time today when I saw a friend's Facebook post remembering one of our teachers. Mr. Campbell died 17 years ago today, and yet it feels like it just happened. Mr. Campbell was one of a kind. He taught sociology in a way that was so far ahead of its time. He always treated us like adults, even when we didn't act like them. He was honest and thoughtful and tolerant beyond belief. No other teacher tried to understand us, tried to know us, tried to really reach us, the way that he did. I had the pleasure of taking his class my senior year. It was a class that was so coveted, students would fight to get placed in it. In fact, I can remember receiving my schedule the summer before my senior year started. I had selected the class, but I wasn't registered for it when my schedule came. I didn't even wait 24 hours before I was up at the school arguing with my guidance counselor to get in the class. Mr. Campbell was so good that his reputation preceded him. It was the class to take. Our school was incredibly diverse, boasting students of all colors and nationalities, and Mr. Campbell made sure we were aware of it. His classroom was plastered with posters about various issues -- homelessness, HIV/AIDS, diversity, you name it -- and they reflected his personality. He was the most open-minded, accepting person I had ever met before or since. He required each of us to complete community service long before it was a requirement for graduation. In his class, you could disagree with him or other students, but it never got personal (which is a feat of epic proportions with teenagers). And he loved us all. And we loved him back. One day during our third period class, Mr. Campbell solemnly (and if I'm going to be honest, nervously) told us that he was HIV positive. He was honest and treated us like the young adults that we were . . . never sugarcoating any of it. We were shocked, but it didn't make us love him any less. At the end of class, as the bell was ringing, each of us lined up to express our support and share a tearful embrace with him. The entire school -- the entire community -- rallied in support around him. Later that year, during a unit on death and dying, we visited a funeral home and cemetary where Mr. Campbell talked to us frankly, and showed us what he had picked out for his own funeral. We honored him at graduation, and when I went away to college in Ohio later that year, he promised to keep in touch. We exchanged letters from time to time, but there's one particular thing that I will never forget. I was lounging in my dorm room one fall afternoon my freshman year when the phone rang. I almost didn't answer it because I was getting ready to take a nap, but when I did, I heard a familiar voice on the other end. "This is Mr. Campbell! We're at the student center . . . come out and meet us!" I was stunned. "My student center? At my school?" "Yes, come over here and meet us!" I put on my shoes and went running across the street where I saw Mr. Campbell and his partner John waiting for me. It turns out that they were driving from Indiana back to D.C. when he saw the sign for my school and told John, "Oh, that's WashingTina's school. We can't drive by and not stop!" So they did. They had bought an armoire, which was wedged in the back of the car, so I squeezed myself in next to it and off we went for an early dinner. I didn't care -- it was the best surprise ever. We had a great meal, catching up. It was just the dose of home that I needed being so far away from D.C. The three of us has our picture taken in front of the student center that day, which I still have framed in our apartment. Mr. Campbell got sick and was hospitalized while I was home at Christmas, so another friend and I went to visit him. It was the last time we ever saw him. He died in early February, 1994. At his memorial service more than 600 family, friends, colleagues, and former students showed up to remember our hero. The board of education issued a proclamation commending his teaching and the impact he had had on the community. There were many that spoke about him that day, students whose lives he had impacted. Another teacher from my high school gave a speech that embodied Mr. Campbell's legacy. The movie Schindler's List was just out that year, and the speaker told us that we were Mr. Campbell's list -- that our responsibility was to carry his legacy forward, to teach the way he taught us, to love each other, and to tell his story. I'm so happy to have known Mr. Campbell, to have felt his influence, and to have learned from his example. I've kept in touch with his partner, John, over the years, and when WH and I were married, he and his current partner were there with us. It was Mr. Campbell's birthday that day, and I'm certain he was there with us too. The circle of Mr. Campbell's influence keeps growing as all of us who knew him embrace each other, and open our arms to those who never did. I'll never forget what he taught me and the legacy that it is my responsibility to pay forward. "Have you ever been flashed?" WH asked me tonight. "No," I started to say . . . and then I remembered a time when, in fact, I had been flashed. I think it was so traumatic I blocked it out of my memory. But now it's back, so you get to hear all about it. At the beginning of my sophomore year of college, my family and I were driving back to my school in the middle-of-nowhere Ohio. My parents were in the front car and my sister and I were following them, cruising along, top down, in my beloved Mustang, Flash. I had recently procured a CD of TV show theme songs from the 70s and 80s, and we were singing along at the top of our lungs to The Facts of Life theme song (the irony of this is not lost on me). Suddenly my sister started screaming. "Look, look! That man is showing us his . . ." and lo and behold, driving next to us in a beat up old sedan was a creepy pervert driving with one hand (going somewhere around 70 mph, no less) while the other hand was hanging his johnson out the window. He had his tongue lolling out of his mouth and his eyes were bugged all out. He had a ruddy complexion and was sweaty and had greasy hair. I really will never for get it. My sister and I both started screaming, and I think I rolled up the window . . . as if it wasn't made of clear glass and could shut him out. I also stepped on the gas. It's a wonder I didn't crash the car. But what's more, I don't know how he didn't crash the car. Little Sister and I spent a the last hour of the trip analyzing how on earth he managed to keep his foot on the gas, steer the car, all at the same time as he was wagging his pickle at us. We weren't able to figure it out then, and I can't figure it out now. I also can't hear The Facts of Life theme song without having a violent flashback. "You take the good, you take the bad, you take 'em both . . . and there you have the facts of life." Ain't that the truth! In the context of a project we were working on, my boss was telling me a story today about a party she was at with Supreme Court Justice Breyer. You know, a typical Washington story. I'll bet you'd never guess where this party was? If you guessed at The Watergate, you'd be right on the money. Because where else do you suppose Supreme Court Justices party? This got me thinking about a party I attended with a Supreme Court Justice. Yeah, that's right, I'm from Washington and I can name drop too! A few years back, the organization I worked for was having its annual conference, and Sandra Day O'Connor was scheduled to speak. It was customary to invite the speakers to attend the receptions, but they never actually did. Flash forward to the reception: I was waiting in the receiving line with some of my colleagues to greet and congratulate the president of our board of directors. It was nearly our turn when this little old lady walked up and cut in line in front of us. I elbowed my friend and said, "Hey, kick that old lady. She cut in line." Do you see where this story is going? My coworker said, "Sandra Day O'Connor? You want me to kick Sandra Day O'Connor?" Cue jaw drop. The Justice had dropped in on the party and spent the next hour or so mingling with staff and leadership of the organization. She was incredibly gracious and friendly, and even took a few moments to give some improptu remarks to the group. I approached her and introduced myself and she was absolutely lovely. And not just because she was afraid I might kick her and run away. I learned my lesson that day, friends: never kick an old lady and/or a Supreme Court Justice (sitting or retired), even if she cuts in line. P.S. Just so you don't think that I'm really the sort of person who goes around kicking old ladies and Supreme Court Justices, I was at an event last year with Ruth Bader Ginsburg and I didn't even think about kicking her. So there.